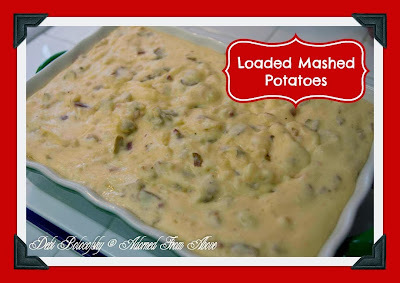 This is my oldest son, Vince's, recipe for Loaded Mashed Potatoes and they are truly amazing. We love it when he makes them for our holiday dinners. This is truly an exceptional recipe. He just gave me a taste, and I told him they "tasted like Heaven on a Spoon". I am really grateful that he and my other children like to cook also. It's really fun. Add potatoes to a large pan or large bowl and add butter, mash with a potato masher. Then add whipping cream, cream cheese, sour cream cheddar cheese, Cholula, salt and pepper and stir together. Next, add the bacon and finish stirring. These Loaded Mashed Potatoes are so delicious. I hope that you like them as much as we do. These do sound wonderful, and how nice to have you son make them. I can see why you all would like them. The ingredient list is all such good stuff.